Due to open in May 2019, Ikos Aria is perfect for couples and families looking for a relaxing break where everything is taken care of. The Infinite Lifestyle™ option which is included at Ikos Aria but also featured at other Ikos hotels was voted Best All Inclusive on TripAdvisor and offers guests an All Inclusive holiday, reimagined. Activities including Kids’ Clubs, yoga on the beach, introductory scuba diving and more come as standard, as well as innovative menus designed by Michelin starred chefs. Wash this down with delicious cocktails and fine wines before heading to your elegant room complete with excellent amenities. Throughout the hotel you’ll find beautifully manicured gardens which lead down to the azure waters of the Aegean Sea, while the interiors are elegant and understated, with bright open spaces. Choose from five swimming pools, relax in the spa or while away the day on the beach, ordering food and drinks straight to your lounger. Ikos Aria has 373 guest rooms and balconies. Child prices apply to children up to 12 years. Infinite Lifestyle™ - Breakfast and/or lunch and/or dinner served in the following venues (please see restaurants for operating times): Flavors (Mediterranean buffet restaurant for breakfast, lunch and dinner), Ouzo (Greek à la carte), Kos (Local Kos à la carte), Fresco (Italian), Anaya (Asian à la carte), Provence (French Provençal a la carte). Dine Out Service – use of designated local restaurant(s). Extensive selection of wine labels from Ikos wine cellar. All à la carte restaurants require dinner reservation. Beach and pool food & beverage service with drinks, cocktails and snacks pass around, served to guests’ sunbeds. 24 hour room service. Midday snacks; coffee and tea, sweets and ice cream; local and international branded drinks - all served in several bars (at least one open 10.00 – 02.00). Fully stocked mini bar daily replenished with branded spirits; use of sun beds and umbrellas by the pool and beach; safety box in room. Sports & Entertainment activities: Table tennis, aqua aerobics, beach volley, basketball courts, tennis courts (reservation required); mountain bikes, non-motorized watersports (windsurfing once per stay, canoe/pedalo/SUP once per day 20 mins). Live evening shows, daily supervised animation program and group activities. Gym-Fitness centre (16yrs and up) with varied fitness course program for all. Main swimming pool, kids pool, infant paddling pool, indoor pool (16yrs and up), steam bath and sauna (16yrs and up). Usage of Kids Club (ages 4 years – 12 years) and Teenager Club (13 years – 17 years, operated during July and August) operated by experienced UK childcare provider (reservation required). Choose from delicious succulent meats, fresh produce and more at this Mediterranean style buffet. A selection of excellent wines is also available. Enjoy beautiful views of the Aegean as you choose from innovative options from the menu designed by Michelin starred chef Lazarou. Taste contemporary Greek dishes with a twist washed down with excellent wine pairings. Reservations are required for dinner, children’s menus are available and shorts and flip flops are not permitted for dinner. Immerse yourself in the delicious cuisine traditional to the island of Kos, including fresh seafood and local produce. Reservations are required, children’s menus are available and shorts and flip flops are not permitted. Enjoy beautiful views of the Aegean as you choose from fresh, authentic Italian dishes with a twist, designed by Michelin starred chef Ettore Botrini. Famous Chef Katsu has specially designed a menu full of favourite dishes from Asia, with influences from India, China, Thailand and more. Relax on the terrace or enjoy the fresh, bright interiors of the restaurant. Overlooking Ikos Aria’s swimming pool, Provence is an elegant restaurant featuring a menu full of classic French cuisine from the Provence region. Designed by Michelin starred chef Anthony Jehanno, this is the perfect place for a relaxed dinner. Ikos Aria’s Dine Out options include a selection of restaurants offering the best of Kos’ fantastic cuisine. Eat in a different local restaurant every night, each of which has been selected by the hotel’s expert staff. There are seven bars to choose from during your stay, each featuring their own atmosphere and expert mixologists. Watch as the bartenders create exotic cocktails behind the bar, or choose from the excellent selection of fine wines, beers, spirits and champagnes. Right in front of the hotel guests will find an 850m stretch of golden sands where you can make the most of the sun loungers or paddle in the cool waters. Waiters will bring delicious snacks and refreshments straight to your sunbed, and children over four years can be entertained by the staff as you try water sports or just relax. The childcare service is complimentary for up to 30 minutes. Choose from five swimming pools, including two large outdoor pools, an exclusive deluxe collection pool, a spa pool and an adult’s only swimming pool. You can also enjoy waiter service straight to your lounger, as well as sunbeds, parasols and terraces to relax on. Your little ones will be taken care of while you spend the day at the beach or in the spa. Expert staff are on hand to ensure children are entertained and kept safe. Children can take part in lots of activities and fun with other guests their own age in the Mini Club. Childcare experts will arrange sports, arts and crafts and more throughout the day. The Teen Club allows older children to keep active and make new friends with a variety of activities. Expert staff can arrange a variety of activities, including sports, cooking and lots more. Football lovers and newbies can learn new skills and practice their game with professionals on hand to coach them. Guests will leave Ikos Aria’s spa feeling fully relaxed and refreshed after choosing from an extensive menu of treatments. Choose from massages, facials, body wraps, couples’ therapies and lots more. There is also a heated pool with a jacuzzi and beautiful views from floor length windows, a steam room and a sauna. Keep fit and active at the hotel’s fitness studio during your stay. The air conditioned room contains state of the art fitness equipment, including cardio and strength machines. Choose from hair treatments and cuts, as well as manicures, pedicures and more at the Ikos Aria’s nail salon and hairdressing salon. There is also a beauty corner which sells Anne Sémonin products. Ikos Aria offers a choice of fantastic activities and sports to try during your stay. There are two tennis courts, aerobics and aqua aerobics classes, yoga, mini football, pilates, giant chess and lots more. Some activities may incur an extra charge. Choose from beach volleyball, canoeing, an introductory scuba diving lesson, pedalos, windsurfing and more on the hotel’s private beach. 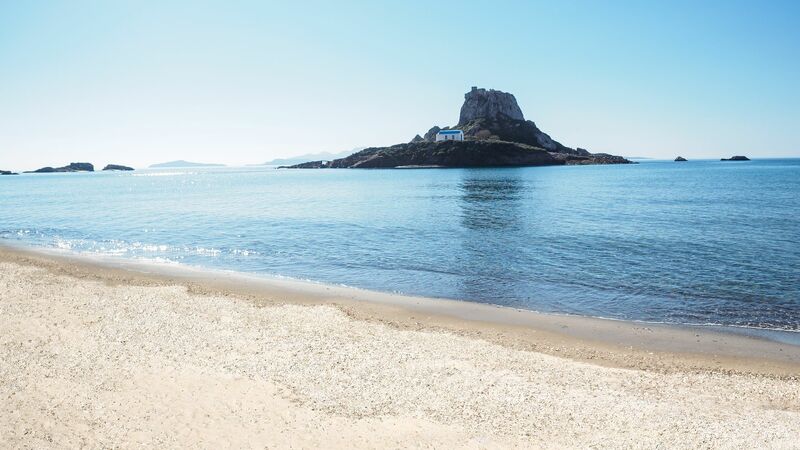 Located on the southwest coast of Kos, Ikos Aria is perfect for those wanting to immerse themselves in the wonderful culture the Greek Islands are so well known for. Choose from an excellent selection of local restaurants and bars, with everything from family run tavernas to fine dining and gourmet cuisine offered close to the hotel. Ikos Aria is just a 45 minute drive from lively Kos Town, where you will find a huge range of amenities for families, couples and groups of friends. Indulge in some retail therapy at the small boutiques, or pick up gifts and souvenirs for loved ones at home. Alternatively, explore the countryside with bike hire available from the hotel, as well as experienced staff who can help you find a walking trail to suit your group. Boat trips can also be arranged from the hotel and offer a chance to see the stunning coastline, with its little whitewashed fishing villages. Ikos Aria is a 20 minute drive from Kos Airport. These stylish and chic rooms have a neutral palate with panoramic windows offering a view of the landscaped hotel gardens. Choose from a twin or king size bed, and there is also a comfortable seating area, flat screen TV and an en suite bathroom. Continuing the elegant and stylish décor found throughout the rest of the Ikos Aria complex, these rooms have panoramic windows with views of the sparkling sea. Choose from a twin or king size bed, and relax in the comfortable seating area. There is also a flat screen TV and an en suite bathroom. Relax in the chic interiors as you take in the views of the hotel’s landscaped gardens through floor length windows. Enjoy your private balcony, a flat screen TV, and take in the side sea views and beautiful landscaped gardens. There is also a large en suite bathroom. Enjoy the elegant interiors with modern touches of luxury as you relax on comfortable beds or enjoy the flat screen TV. The panoramic windows offer views of the sparkling Aegean Sea, and there is also a balcony with comfortable seating. The room also has a large en suite bathroom. The spacious suites offer plenty of room for families. Junior Suites offers chic and elegant décor and large floor length windows leading out onto a private balcony. Enjoy comfortable seating and beds, a flat screen TV and large en suite bathroom. Enjoy bright and airy indoor and outdoor living, with plenty of space for families and elegant décor throughout. There is a private garden with a seating area and all Junior Suites have floor length windows which offer views across the garden. There is also a flat screen TV and a large en suite bathroom. Enjoy spacious indoor and outdoor living, with chic interiors and exteriors. There is a private garden with comfortable seating and each of the rooms has floor length windows which offer views of the garden and Aegean Sea. There is also a flat screen TV and a large en suite bathroom. These one bedroom suites are perfect for families, with bright and spacious rooms and a separate living room and bedroom for privacy. Each of the rooms is decorated in the chic, elegant style found throughout the rest of the Ikos Aria, and there are panoramic windows with views of the beautiful sea. There is also a large en suite bathroom. Perfect for families or couples wanting to enjoy the spacious rooms, the one bedroom suites have a separate living room and bedroom. Enjoy the elegant décor throughout the suite, as well as panoramic windows which lead out to your private gardens. Outside, soak in the views of the Aegean Sea as you relax on comfortable seating. The suites also have an en suite bathroom. These luxurious suites are located close to the golden sands of the beach and enjoy a private garden with sun loungers. Inside guests can enjoy floor length windows with beautiful views of Ikos Aria’s landscaped gardens and combines a bedroom and living room in one open plan design. The suites also have a large en suite bathroom. Guests staying in the hotel’s Deluxe accommodation can make the most of the exclusive Deluxe area. Here you’ll find a large swimming pool, and a separate section of the beach. Deluxe guests can also enjoy two complimentary neck and back treatments per stay. These luxurious suites are located close to the golden sands of the beach and enjoy a private garden with sun loungers and views of the Aegean. Inside you’ll find chic and elegant décor, floor length windows with beautiful views and combines a bedroom and living room in one open plan design. There is also a large en suite bathroom. Guests staying in Deluxe accommodation can enjoy their own private area of the resort. There’s a separate swimming pool and section of the beach. Deluxe guests are also offered two complimentary neck and back treatments per stay. These spacious suites are perfect for families wanting to enjoy space and privacy during their stay. The interiors are large and elegant and have panoramic windows with views down to the Aegean Sea. There is also a balcony with comfortable seating and sea views, as well as an en suite bathroom. Guests staying in one of the hotel’s Deluxe accommodation rooms can enjoy exclusive facilities. There’s a separate swimming pool and section of the beach, as well as two complimentary neck and back treatments per stay. Located on the beach front, these spacious and elegant bungalows are perfect for families wanting to enjoy some space and privacy. There is a separate living room and bedroom, both with full length windows with panoramic views of the sea and your private garden. There are loungers outside, as well as a seating area and an en suite bathroom inside. Deluxe guests can enjoy added exclusive benefits during their stay, including a separate swimming pool and section of the beach and two complimentary neck and back treatments per stay. These bright and spacious suites are perfectly located on the seafront and offer a private garden with your own swimming pool, loungers and seating area. Inside you’ll find a separate bedroom and living room, as well as an en suite bathroom. Guests staying in the Ikos Aria’s Deluxe rooms can enjoy extra luxuries, including an exclusive swimming pool, separate area of the beach and two complimentary neck and back treatments per stay. Located in a quiet area of the hotel, close to the beach, the two bedroom bungalows are spacious and private, perfect for families and small groups. There are two separate bedrooms, two bathrooms, a living room and a spacious garden with your own private swimming pool. The interiors feature large windows with beautiful views and elegant décor. Guests can also enjoy exclusive Deluxe features, including a separate area of the beach and a Deluxe swimming pool, as well as two complimentary neck and back treatments per stay. Enjoy these large and elegant bungalows with bright and spacious interiors and luxury private gardens with a swimming pool. Take in beautiful views of the landscaped gardens and Aegean Sea from the garden and floor length windows, and make the most of the easy access to the beach. There are two bedrooms, each with an en suite bathroom, as well as a separate living room. Guests can also enjoy the Deluxe amenities of the hotel, which include a separate area of the beach and a swimming pool just for Deluxe guests. You can also choose two complimentary neck and back treatments per stay. Save up to 20% discount on the hotel price for holidays between 23 - 27 October 2019. Save up to 10% discount on the hotel price for holidays between 29 June - 08 July 2019 & 29 August - 15 September 2019 & 06 - 14 October 2019. Save up to 5% discount on the hotel price for holidays between 15 May - 28 June 2019. Honeymooners receive a romantic candlelight dinner, sparkling wine upon arrival and a farewell gift (wedding certificate to be presented upon check in) for holidays between 15 May - 27 October 2019 (a minimum stay of 5 nights is required).